In my opinion, there is just something about leopard and red together. They're just such a perfect combination, and I seem to never wear leopard without at least a hint of red anymore! I added a black shirt and flats to balance the look out, and threw on my trusty jean jacket for dealing with cold, air conditioned rooms! 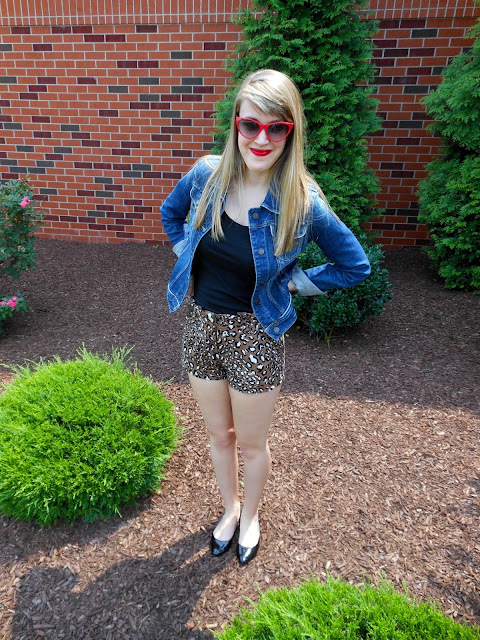 shirt: Delias (similar)// shorts: Forever 21 (similar) // jacket: Abercrombie (similar) // flats: Steve Madden (similar) // sunglasses: Old Navy (similar) // lips: Rimmel London "Diva Red"
Who else feels the same about red and leopard? That shade of red couldn't be more perfect on you! This is such a sweet look, kind of reminds me of Taylor Swift! Leopard and red is one of my favorite combos!! And those shorts are adorable!! Yep, totally love leopard and red together! Nice sunnies, love the colour!